Recruiting advertisments in the October 11, 1861 issue of the Louisville Anzeiger newspaper. 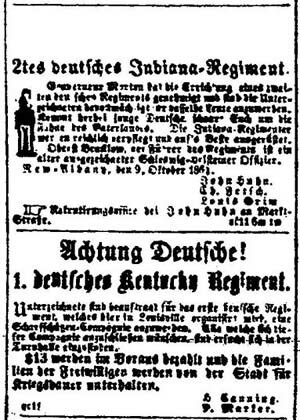 Top ad is for the 2nd German Indiana Regiment and the bottom ad is for the 1st German Kentucky Regiment. A presentation made at a joint meeting of the Indiana Germanic Heritage Society, Kentuckiana Germanic Heritage Society, and the Indiana Chapter of the Palatines to America, at Indianapolis Indiana, March 18, 2000. Contents: Where They Lived; Religious and Political Differences; German-Americans Rally Around the Flag; Why They Volunteered and How They Were Recruited; Where They Fought; Prejudices; Performance.